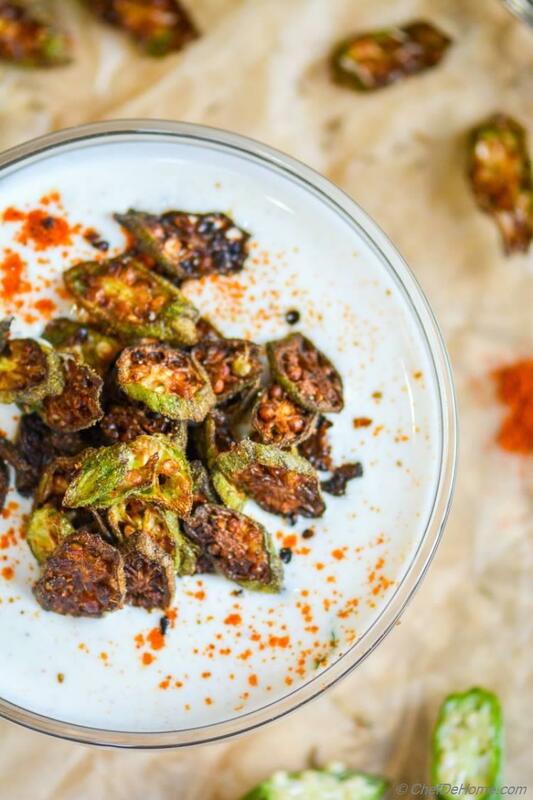 Sharing with you, crispy okra (Indian name: Bhindi), fried and coated in special blend of homemade seasoning, to make a flavorful and an easy yogurt side dish: Bhindi Raita! 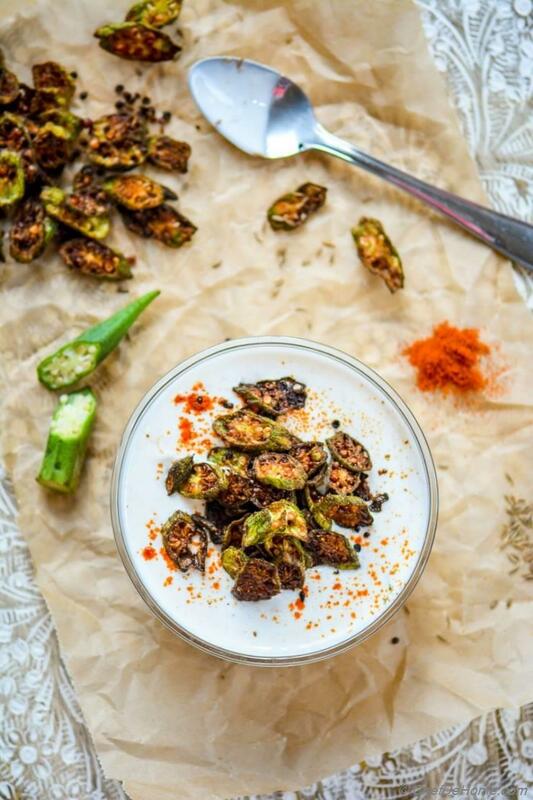 I'm sure you like Okra in Gumbos and even fried with cajon spices....... but, even if you don't like Okra, this spiced yogurt raita with crispy okra will make you fall in love with it! My one more recipe published in Magazine!!! Yesterday, one of my Indian Recipe: Curried Cauliflower, was published in Summer edition of Low Sugar Living Magazine. I'm really excited to share the picture with you! Coming soon! 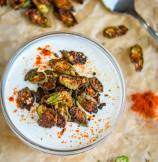 Crispy Bhindi Raita is very self-sufficient yogurt side. You don't need a big plate filled of Indian food to enjoy this side dish!. My family enjoys it just with plain steamed Basmati Rice or Indian Roti. The crispy and crunchy okra and chilled creamy yogurt, give very good textural contrast to this raita which really needs nothing else! It is safe to say, this side dish can be a lite and delicious main course as well!! Really, once you try it, you cannot stop eating!! Other than vegetables (cucumber, okra, tomatoes, onions etc) added to raita, the key to make a flavorful Indian Raita is Raita Masala (Seasonings)! Masala (spice mix or seasoning) has lot of variations in Indian cuisine. 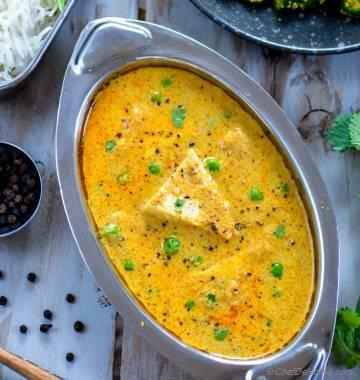 Even though referred as "masala" in general..... a masala actually can have N variations.... as many as number of curries eaten in India! I mean, a LOT! We even like to spice up, I mean, add masala in our everyday yogurt side. So, I thought to share here, a quick recipe, to make raita masala from scratch. Not hot spicy version.... yet very flavorful and easy, everyday Raita Masala. This Raita Masala is combination of very commonly used Indian spices and gives LOTS of flavor to Raita. At home mostly, I toast fresh cumin seeds to make toasted cumin powder for raita masala. (fresh toasted cumin has lot more flavor.) You are most welcome to toast fresh seeds or use powder, whichever is easily available to you. Even if you don't have all ingredients to make raita masala, juts try adding a little crushed roasted cumin to your next Yogurt Dip or Raita and you will know, how much flavor it adds! We eat a lot of Okra in my home. Specially curried okra or spiced okra. I know, some people find it slimy and sticky. However, if okra is cooked: fried or baked, for right amount of time, you can get word's best tasting crispy okra! Sometimes back, I shared Oven Baked Okra Fries recipe. Trust me, friends, Okra Fries were more crunchy that deep-fried potato fries! This is a delightfully interesting week for Chef De Home. 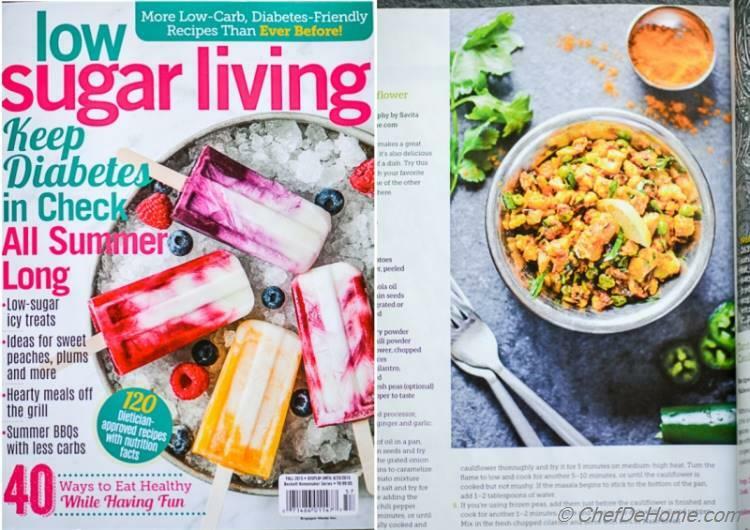 Few of my recipes have made to BuzzFeed, CommuntiyTable, and one of my Indian Recipe has been published in Low Sugar Living Magazine. Really enjoying it! Thanks all you friends for your support and encouragement. 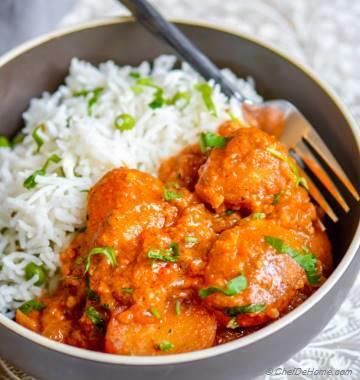 A few Indian curries, to enjoy a complete Indian Dinner, at home! Total Time 15 minutes Prep Time 10 minutes Cook Time 5 minutes Difficulty Easy Yields 2 Cups Raita Serves 4 Notes No. of servings depends on serving size! 1. Wash and pat dry bhindi(okra) using a paper or clean kitchen towel. It should be fully dry. Then slice into thin round pieces. It is important to slice bhindi thin or it will not get good crispy when fried. 2. Divide all spices listed above into two equal parts. One part will be used to season fried okra and second to season yogurt to make raita. Set aside. 3. In a medium bowl, add yogurt and whisk it to make lump-free and smooth. You can use 1-2 tbsp water if yogurt appears to be thick. 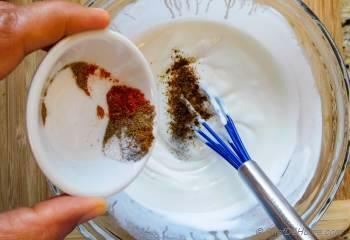 Add half of the seasoning into yogurt, mix well, and set aside. 4. Heat few tbsp oil in a small frying/saute pan ( to get 1/2 to max 1 inch layer of oil). Add sliced okra and fry for 2-3 minutes. If pan is small, fry in two batches. You can also use deep pan, I prefer to shallow fry it in less oil in small pan. Or use a non-stick wide pan with 2 tbsp oil. 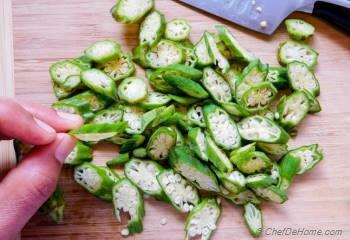 Remember, you don't need to use a whole lot oil to fry sliced okra. 5. 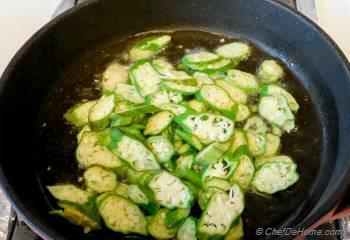 Once okra starts turning crispy and brown at edges, remove from fryer to a plate lined with paper towel. Sprinkle remaining spices (masala mix), divided in step 2, and mix gently to distribute spices evenly. 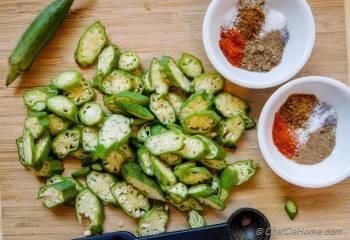 For max flavor, add masala while okra is hot, just out of fryer. 6. 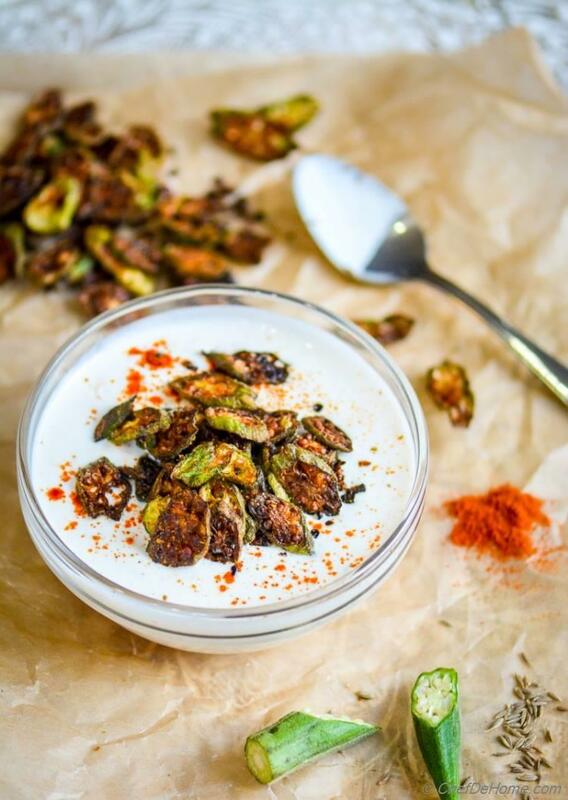 Add half of the fried okra into yogurt and mix well. Keep the second half on side and add it to raita just before serving. This way t will add crunchy and crispy surprise in raita! Enjoy! 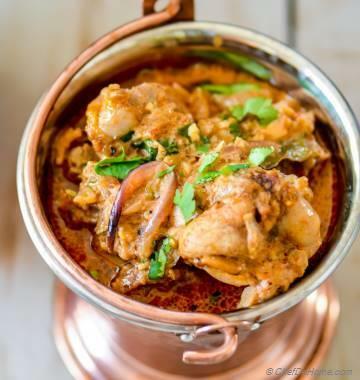 I love this dish, Savita. Tonight will be my 5th time making it. Looks crispy and delicious! Haven't had okra in a while! Congrats, well done and deserved! Okay - I NEED this okra!! 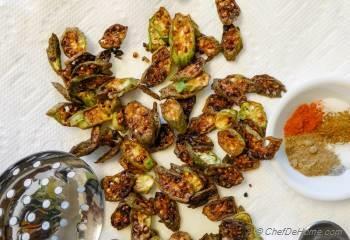 Fried okra is one of the most delicious things ever, and yours looks so perfect and flavorful! Yum :). Congrats! That is amazing and very well deserved. I only recently discovered okra, but I love it. Shweta, first of thank a lot dear. Second, you should try okra raita soon, I know you will like it! Congratulations dear Savita..Okra raita looks delicious !! Jolly, thanks for lovely words, my friend! I appreciate it! Gauir, I share same love for okra too! our very own favorite bhindi ki sabji! :) Thanks a lot my friend for sweet words! I really appreciate! Congratulations Savita. Bhindi raita is my favorite and your version is awesome. I am going to try this out soon. YUMMY! Kushi, thanks! I hope you like raita when you try! Congrats Savita!! You deserve it for sure. I have never try raita but these one looks so good and crispy. Oriana, thank you so much for kind words. :) I recommend you try raita once, I'm certain you will like it. Shubha, thanks! I have always made bhindi raita this way. Now, I'm curious to try your version! 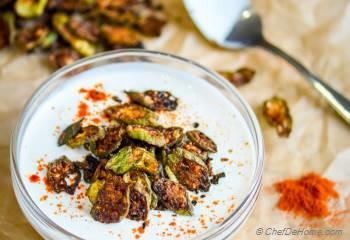 I love crispy bhindi raita! Mmmm this looks mouth-watering!! and congratulations of your recipe getting published in the magazine, yay! :) sending you an email regarding that! Piyali, thanks my friend! Such a sweet words, I so appreciate!